Port Lockroy on the Antarctic Pensinsula is home to 3,000 gentoo penguins and Antarctica’s most-visited tourist attraction, a unique British post office known informally as the ‘Penguin Post Office’. However, it wasn’t always this way. The port has at various times been a center for whaling, a military base and a scientific research facility. Click on the yellow nodes of the timeline below to find out more about Port Lockroy’s colorful past and the origin of the ‘Penguin Post Office’. German explorer Eduard Dallman discovers Port Lockroy in 1873 while exploring the area for whales on board the ship Grönland. Captain Jean Baptiste Charcot visits and charts Port Lockroy during the first French Antarctic expedition. Charcot names it Port Lockroy after French politician Édouard Lockroy who helped fund his expedition. Whalers removing blubber from a whale. The Port becomes known as a safe harbor and is used by the whaling industry until 1931. Members of Operation 'Tabarin' on board SS 'Eagle' at Deception Island. February 11, 1945. The British government mounts a mission, code-named Operation 'Tabarin' (named after a famous Parisian nightclub of the time), to establish a permanent presence in Antarctica. 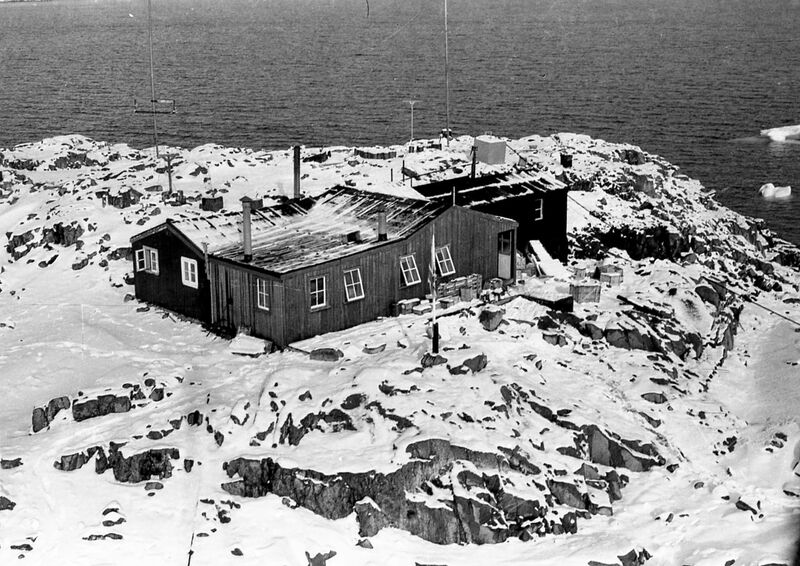 Britain establishes a base at Port Lockroy during Operation 'Tabarin', a British World War II expedition. The purpose of the Operation is to reinforce territorial claims through the establishment of a post office and a permanent British presence on the Peninsula. The main building, called Bransfield House, is constructed. Bransfield House and the Nissen Hut (left) amidst a mess of wires and antennas. A semi-circular steel Nissen hut is built at Port Lockroy and used for storage throughout the base's operation. The original building collapsed sometime in the 1990s. Scientist's working in the field at Port Lockroy. Following the end of the war the base is handed over to science. The British Antarctic Survey operates the base as a science research station until 1962. The primary scientific work at Port Lockroy was ionospheric research (the study of the upper atmosphere) which was critical in understanding high frequency radio. Other scientific work included the study of how lichens, birds and mammals survived the harsh conditions of the Antarctic. The base is closed as the British have established other more modern science stations along the Antarctic Peninsula. It subsequently falls into disrepair. Gentoo penguins (Pygoscelis papua) are thought to have first established a colony on the island in 1985. A sign alerts visitors the Port Lockroy's historical importance. Port Lockroy's historical importance is recognized when an international treaty designates the site as Antarctic Historic Site and Monument No. 61. The base is re-opened. A small team of four carpenters spends two to three months restoring the base as much as possible to its 1962 condition. An environmental monitoring program is established to investigate potential visitor disturbance to the gentoo penguin population. Bransfield House and UKAHT team with some of Port Lockroy's penguin population. The United Kingdom Antarctic Heritage Trust takes over management of Port Lockroy. The UKAHT, a not-for-profit charity, employs a small team during the summer months to operate the base and welcome visitors. It is operated as a museum and representative British Antarctic base from the 1950s. The small gift shop and post office help to finance the operation of the museum, ongoing maintenance work to the buildings at Port Lockroy and all the conservation work that is carried out at other Historic Sites and Monuments on the Peninsula. Email correspondence with the UK Antarctic Heritage Trust.